The Neon Neuron Blog: Updates: New Looks for the Blogs! Yeah, I changed the titles. I think they look a bit cleaner, now. Still working on the main site, hoping to streamline it, further. The older site had too many pages, which meant, too many clicks. And, too many clicks gets boring, and a bit redundant. Am I right? 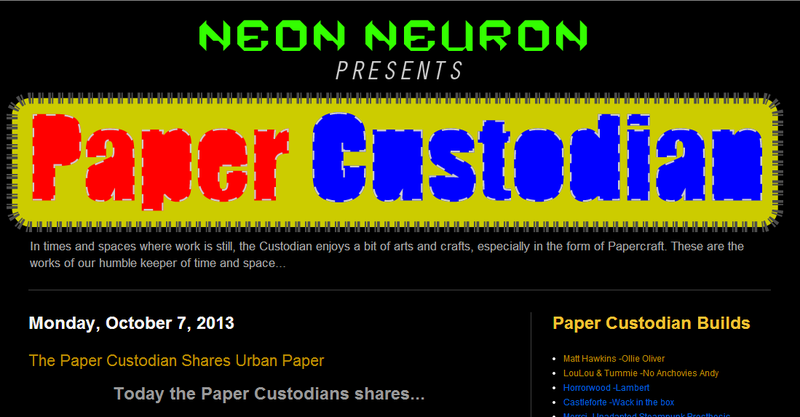 I encourage you to head over to the Paper Custodian blog to see the latest builds and our newest feature, Paper Custodian Shares! This week he's sharing the papertoy book URBAN PAPER. It's a good book to start your paper crafting adventures. I'll get the main site back online soon, with a new toy debut! So, hang on to yer' lug nuts, it's time fer an overhaul!